Speak to our friendly customer care operators for a free and non-binding price offer for interior and exterior window cleaning today. Call 020 3746 1366 or fill up the contact form on our website. Gutter cleaning must be done at least once a year, so that you avoid gutter and downpipes clogging and water damage to your building. Ashlee House Cleaning has vetted, skilled and experienced gutter cleaners who can efficiently clean out any twigs, leaves and other waste. They will ensure that you get your gutters clean by using telescopic pipes with cameras, connected to powerful water or dry vacuum cleaner. You will be provided with photos of the condition of your downpipes and gutters. This service is provided with a 30 days quality guarantee, and we will come back to re-clean if they get clogged during that time. We have adequately outfitted and trained roof cleaners who are going to use effective pressure washing gear to remove mould, algae, lichen, streaky stains and moss from rooftops. House roof cleaning is necessary if you want your premises to look fine, and is also important because certain harmful growths can basically “eat” and affect your roof if left untreated for an extended period. Our service is fully insured and at an excellent price! Order top-quality window cleaning in Bromley Common BR2 now! To try to make the booking procedure as swift and easy as possible, we have integrated a terrific 24/7 system. You simply just need to make contact with us by either dialling 020 3746 1366 or filling out our online contact form. You can demand a free quote or directly book our window cleaning Bromley Common BR2 service today. 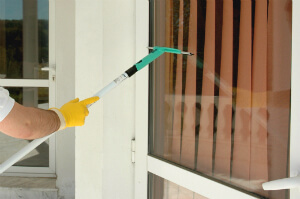 Our expert window cleaners can arrive on virtually any day of the calendar year. We have public holiday and weekend availability. We have good rates, no concealed fees, and no downpayment for booking. We will give you a price reduction for every other service you request together with the window cleaning. Property managers and estate firms get reduced prices as well. Take advantage of our environmentally friendly, professional and cost-effective cleaning services and make a booking today. You will get an e-mail verification inside of the next two hours!